In 1992, the our famous “Exec-U-Dig” program was launched, enabling members of the private sector to join us for a week of digging on Yeronisos. Bankers, lawyers, physicians, moms, authors, journalists, academics, businessmen and women alike, have adored their time with us in the trenches, excavating alongside students from the field school. A donation of $10,000 will bring you not only a week on Yeronisos, but a lifetime of memories and the unique joy of uncovering part of our ancient past. Actor Bill Murray, Citcorp’s Bill Rhodes, gallery owner Martha Sutherlund, and author Barnaby Conrad are among those who have joined the team for digging, studying, touring, dancing, swimming, and dining on one of the most beautiful stretches of the Cypriot seaside. 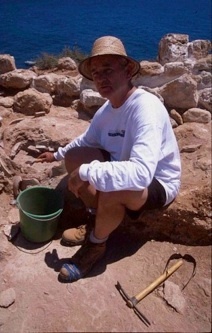 Why not join our distinguished group of Yeronisos Exec-U-Diggers and experience the wonders of field archaeology first hand?